One of my favourite things about Rate the Dress is the way it encourages me to find thematic links between different eras, and garments that seem otherwise unrelated. 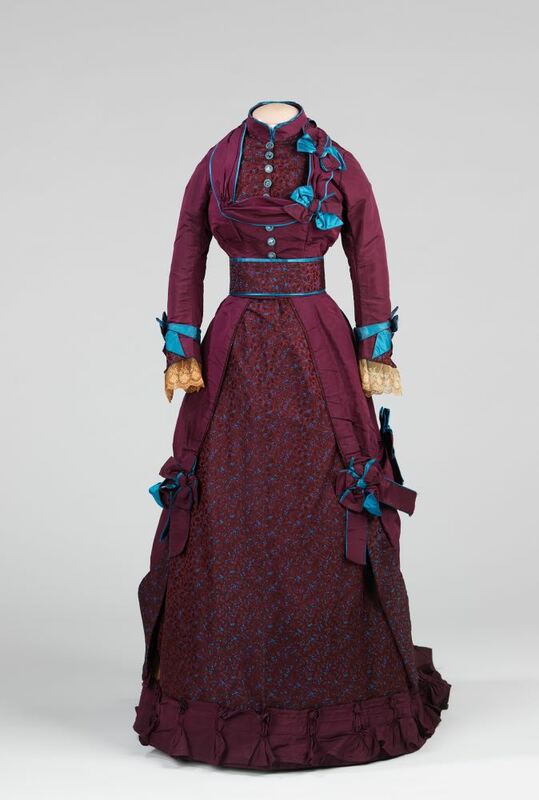 This week’s 1870s Rate the Dress keeps with the theme of buttons playing peek-a-boo amongst the layers, and adds in a bold and unusual colour scheme that Poiret would have definitely approved of. Last week you either liked/really didn’t like the button trim, and thought the back bow ruined/made the dress, and were completely enamoured/turned off by the scalloped hem, and loved/hated the chemise effect and chiffon sleeves. If any element of the dress was someone’s favourite, it was also someone else’s least favourite! Except for all the ones that only had favourites, and the significantly smaller group that totally disliked it. It was a bit of a marmite dress. A dress where the total really doesn’t reflect the majority of individual feelings: out of 37 ratings, only one was a 7.5! 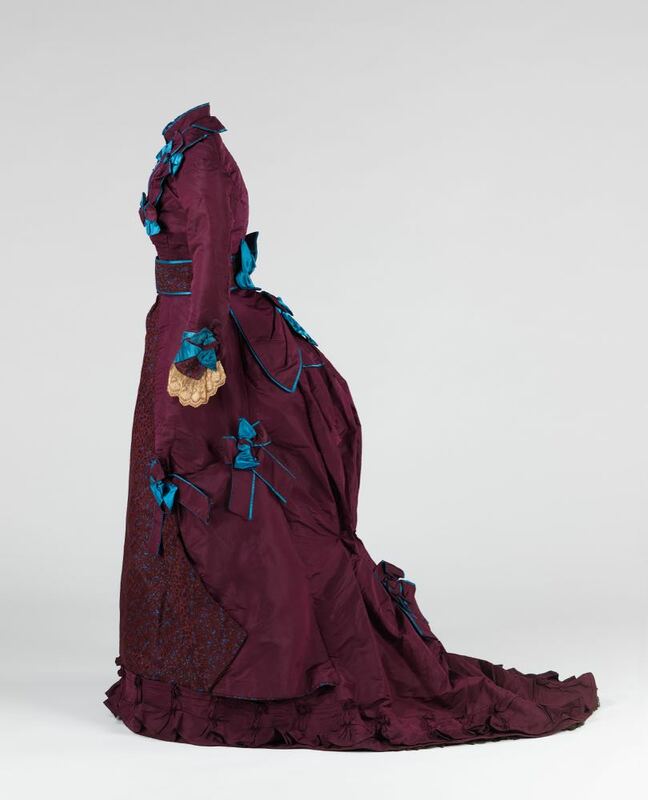 This first-bustle-era dress features deep burgundy red and vivid, almost electric, blue, tied together with a small floral pattern perfectly matched to the colours. Like Poiret’s dress it features buttons running down the centre front, popping in and out of layers. Unlike lasts week’s pick, these buttons are functional (and actually buttons) and end at the waist. Also like Poiret’s dress, it features bows as trim (albeit significantly more of them). And instead of flat scallops, the skirt is edged with elaborate pleating. It’s certainly a different look to Poiret’s dress, but it has some of the same sense of whimsy and playfulness. It’s possible that it was made for a very young woman: it’s quite small, and has only a 7.5″ difference between bust and waist. Whether it was made for a teenager, or a very petite woman, it was certainly made for someone with personality and the willingness to wear something a bit bold. What do you think of it? I like the color scheme (even though it’s not one I would personally wear), and like how the bright blue is used as the binding. I find the buttons charming. But there is one major negative for me – the bows. I find them unnerving, as if whoever wore the dress were under attack by very large and aggressive moths. The bows look both excessive in number and sloppy in form (although that may be due to a need for pressing). First of all, I love the contrast between the deep rich burgundy and the bright turquoise. But that’s the *only* thing I love about this dress. Just about every single styling detail introduces a new level of dumpiness: the “peek-a-boo” squarish draping on the bosom, the combination of that draping with a high, stand collar; the asymmetrical bow placement on the faux square neckline; the multiple bows on the belt, the bow-gatherings on the rear of the skirt (which look to me as though the skirt was grabbed in places and each grab was ornamented with its own bow). The patterned cloth (I can’t tell whether it’s a brocade or just a print) on the belt and skirt front also look dowdy–as though the designer was afraid to use a contrast that would make a stronger statement on those areas. And the shape of the skirt makes for a really odd profile. Because some of these issues are fixable, I’ll go with 6 out of 10. By the way, there is a cut-and-paste error at the top of the post. 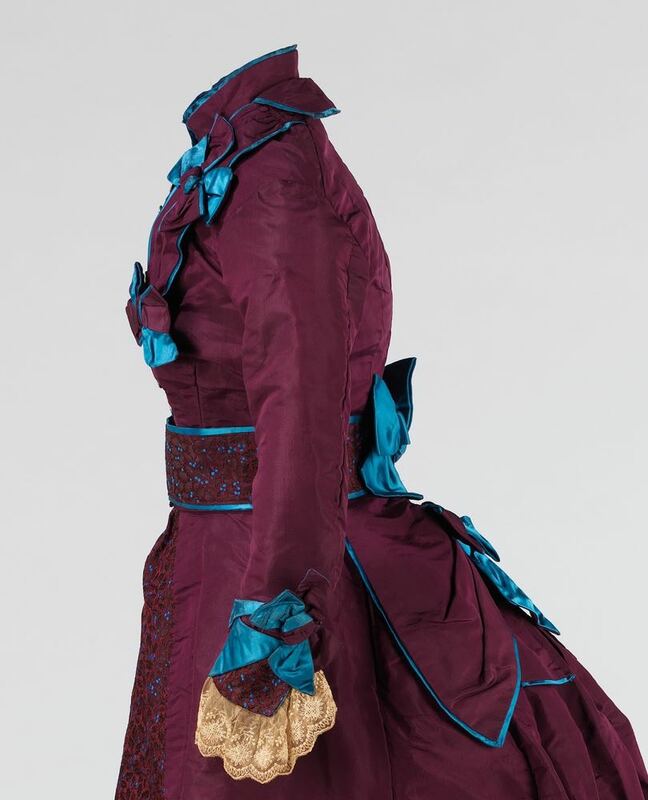 This is not “a 1920s frock by Poiret, which balances the new move towards streamlined and simple with his trademark eye for details and sense of humour and whimsy.” It’s a “bright blue and burgundy 1870’s” as the section heading says. I love this dress. The colours are gorgeous, and the silhouette is fantastic. This is my favorite bustle style, when you don’t get the feeling that the wearer has fallen into a tapestry storage. At first I was hesitant with the bright blue bows, but then I realised that they are exactly what the dress needs. They turn the dress from sombre to eyepopping. I can imagine that the original wearer didn’t mind standing out in a crowd, and it just feels fun and bubbly. It looks like a Disney Villan’s costume. If Cinderella took place on Little House on the Praire, the wicked stepmother would wear this. So I guess I’m just saying that it looks like Mrs. Olsen’s frock. The haphazard bows, fussy trim, crummy decoration along the hem, I just hate it. The patterned fabric was probably the inspiration for the entire color scheme, and the accents of blue seem overwhelming and misplaced. I know a few people who could carry this color combination off – and I’d enjoy seeing the effect. We don’t play with color *nearly* enough in 2018. So, though the color makes me blink, I’ll raise a glass instead of hiding under the couch. The bows look squashed. Probably difficult to fluff at this point. No points reduced for squashed, but we are reducing points for the sheer number and randomness of some of the bows. Understood that a slim maiden might want to inflate her bustline with visual interest – it’s a standard trick. Also fond of a square neckline. No sympathy for the finished product there though – it’s just off. The cuffs go smashingly with the burgandy, but I don’t think they go very well with the aqua. But, probably a bit more yellow than they were – if they were a light ivory, all would be forgiven. I like the color combination of the blue and burgundy (note to self to look for something vaguely like the burgundy fabric! ), until we get to the aggressive moth-bows (perfect description! ). Also agree that the cuff lace isn’t quite working based on the current color, but would be great if they were lighter, so no points off there. Tiny attack Mothras bring my score to a 7/10. The colour combination is really eye catching, but oh no more bows, did the man have a thing about them? They really are excessive so as I don’t like bows anyway and they ruin a quite presentable dress I can only give it 5/10. Sorry I meant the woman designer, a classic more is less. Like people said above, those moth bows! I just can’t get behind this dress. I want to like it, but the bows really deter me. I like the colors. And only the colors. I started to list all the things that bother me about the dress, but honestly it’s the entire dress. A couple points for fabric choice and that’s all I can give it. I really dislike this combo. I think this is partly to my formative years at Intermediate School where burgundy and saxe blue were the school colours. I do love and I mean LOVE, burgundy and sage green and I think it would have looked amazing. Not a big fan of the overall dress, too many tiddly bits. I love detail but bits of high contrast all over the place I find bitsy. I think it *is* your lowest score. Wow! I really don’t like the bust swag. I am not fussed on the buttons in that colour. I really do like the colours and the way they are so perfectly matched to the floral print! (I was peering at it, trying to work out if it was lace with the blue showing from underneath, that’s how well they did.) And that waist band is excellent. It’s one of my favourite eras in silhouette, and I think they’ve done a good job of it. Apart from the bust swag, and possibly changing the squashed back bow for an ordinary one, it’s an excellent dress! Japonisme! 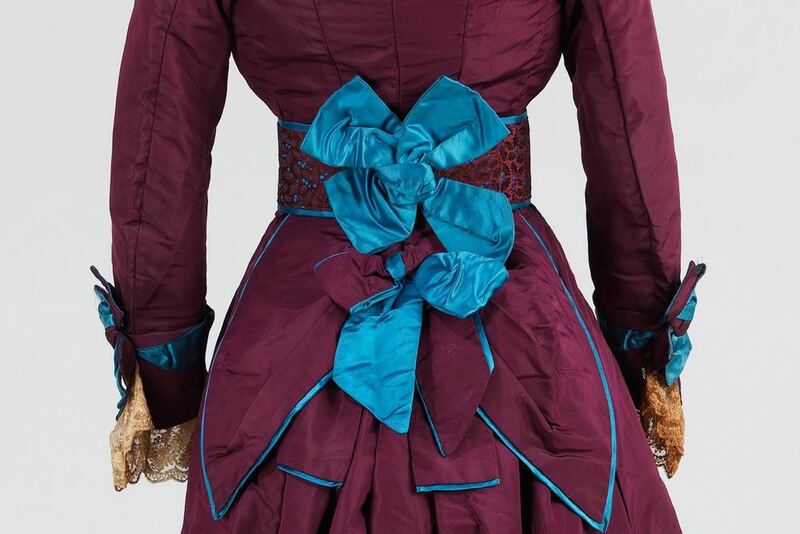 The obi-like broad belt with contrast edgings like the obiage, the big butterfly bow in back … very stylish for 1870s. The piping of bright blue emphasizes the derrière without being bulky like a ruffle would. Bustle era is not my favorite era, but the scale on the bustle doesn’t overwhelm the rest of the dress. The squared bodice is fashionable, and makes me wonder if there was a lace blouse to wear under it for dinner instead of the figured one. But the attack of the killer moth-bows … Except for the one in center back, they don’t help the dress. I love the colours, the shape and especially the geometric shaped trim on the cuffs. I think this is my favourite style of bustle dress but just like many of you the bows are bugging me, there’s so many of them! I feel the big one on the back of the bustle would have been enough. I also don’t really like the big square neckline on the bodice. This dress has a lot going for it–the colors are jazzy, the cut mostly pleases me–I just don’t like the way that sash is tacked on to the front of the bodice. It throws the whole shape off and leaves me with the impression that the model’s torso is misshapen. 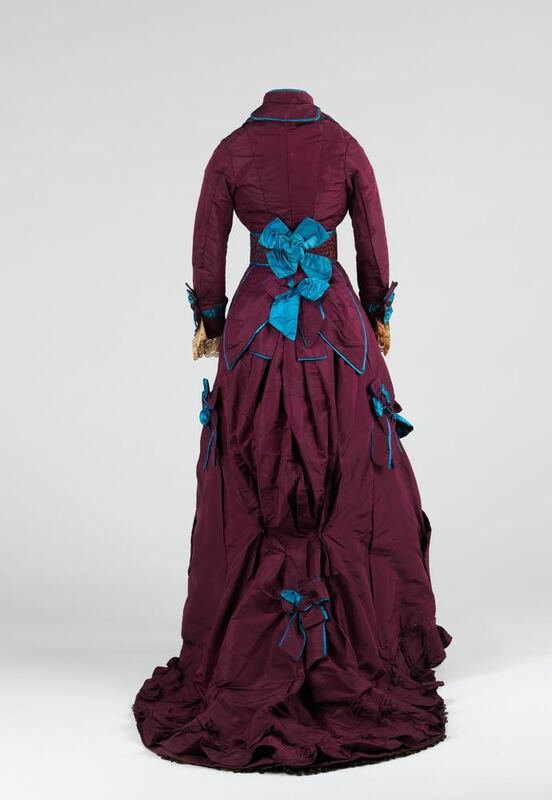 I also would have put the bow that is lowest below the bustle a little higher, right where the fabric is gathered in. The bows and bustle, cuffs and belt, and especially the buttons are just my kind of extra. I love the contrast between the main colors. The designer must have developed the whole look out of that patterned fabric, and I’m so impressed. The trim gives me happy vibes! I’ll give it an 8 because the bodice is so awkward. I like the side profile of this dress better than the other views. Burgundy is great – both solid and print, though I wish we knew what the print’s fabric is. The belt is quite neat – as in a neat waistline, which it certainly suits quite well. I like the square neckline. In full disclosure, it should be noted that with light brown hair and fair skin, burgundy works well on me, I like prints, used to have a small waistline that wore belts well, and I still enjoy wearing square necklines. That’s the good part. But ouch, those brilliant turquoise “I shot an arrow in the air,/ Where it fell I knew not where” bows! The color hurts my eyes and they seem far too random in their placement. I will excuse some of the knock-your-eyes out color as being a result of the aniline dye era, when brilliant colors, newly produced from coal tar, were all the rage and no doubt looked much more subtle under candle or gaslight. Did I mention that minus hands on the model, the lace cuffs have a claw-like appearance in every single one of the photos? Ordinarily I quite like lace, even though this has clearly not aged well color-wise, so I won’t count that as a different model – with hands – might have made a big difference. But I still like burgundy, belts, and square necklines. So 6/10 for me. I looove the colour scheme, but am not too fond of the styling choices. I agree that there are too many bows, and I find the scrunchy thing around the neckline to be particularly awkward. There are a lot of details I like about this one. The idea of beginning with a brocade and then working with those colors as inspiration is very clever; however, from a distance, I wish the dots weren’t so tiny as to make a bit more of a statement and to help make sense of the other turquoise accents. I really like *most* of the design. I like the back, although it lacks the harmonizing brocade. The trim around the skirt is awesome. I like the contrasting gilet with the collar. What I dislike is the bodice trimming, that awkward shirred rectangle. It’s the sort of thing I would have thought looked good as a design when I was making doll clothes at 12. 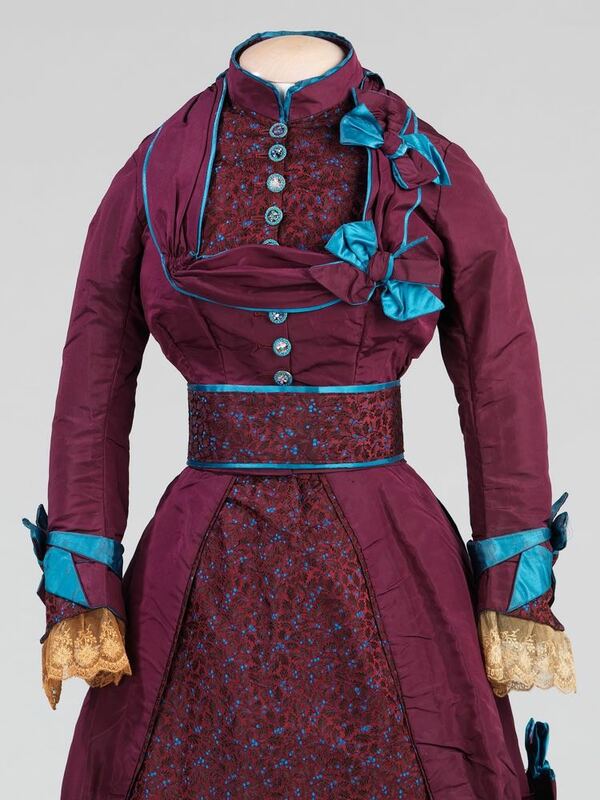 I would definitely recreate the idea of this dress, but with a larger scale brocade to work off of and minus the awful shirred piece – and maybe minus the bows on the bodice, although I think they work well on the skirt. Love this dress except the lace cuffs, they should have been a crisp white, or the same colour.